Heart : Are You Eating Enough 'Powerhouse' Vegetables? THURSDAY, June 5, 2014 (HealthDay News) -- Watercress, Chinese cabbage, chard and beet greens are among the most nutrient-dense "powerhouse" vegetables, packing a huge dose of vitamins and minerals into every calorie, a new study reports. At the same time, don't expect to receive huge amounts of nutrition from raspberries, tangerines, garlic or onions, the findings suggest. National nutrition guidelines emphasize consumption of powerhouse fruits and vegetables, which are strongly associated with reduced risk of chronic disease. But until now, the study author noted, nutritional value of veggies hasn't been ranked in a way that would show which best qualify as nutrient-dense powerhouse foods. For the report, Jennifer Di Noia, an associate professor of sociology at William Paterson University in Wayne, N.J., crafted a list based on the nutritional density of fruits and vegetables, using data from the U.S. Department of Agriculture. "Higher-ranking foods provide more nutrients per calories," Di Noia said. "The scores may help focus consumers on their daily energy needs, and how best to get the most nutrients from their foods. The rankings provide clarity on the nutrient quality of the different foods and may aid in the selection of more nutrient-dense items within the powerhouse group." Di Noia calculated the nutrition contained in 47 fruits and veggies, finding that all but six met the criteria as a powerhouse food. Cruciferous and dark green leafy vegetables dominate the top 10. They are, in order, watercress, Chinese cabbage, chard and beet greens, followed by spinach, chicory, leaf lettuce, parsley, romaine lettuce and collard greens. All the top vegetables contain high levels of B vitamins, vitamin C, vitamin K, iron, riboflavin, niacin and folate -- nutrients that help protect people against cancer and heart disease, the researcher noted. These leafy vegetables taking the top powerhouse spots "makes sense," said Lauri Wright, a spokeswoman for the Academy of Nutrition and Dietetics. "They have a lot of the B-vitamins and a lot of fiber in the leaves," said Wright. "If you think about plants, that's where they store their nutrients. Those green leafy vegetables have a lot of minerals and vitamins and fiber in those leaves, and very few calories." People who chop off the leafy part of vegetables such as celery, carrots or beets are "actually cutting away some very good nutrients," said Wright, an assistant professor at the University of South Florida College of Public Health in Tampa. The six fruits and vegetables that didn't make the list as powerhouse foods are raspberries, tangerines, cranberries, garlic, onions and blueberries. While all contain vitamins and minerals, they are not densely packed with important nutrients, the study said. The full list is published June 5 in the journal Preventing Chronic Disease. Folks will get good nutrition from the powerhouse veggies whether they eat them raw or cook them, as long as they don't boil them, Wright said. "Fresh, you have 100 percent of the vitamins and minerals," she said. "When you cook it, you might lose a small percentage, but it's not significant." 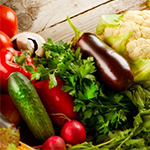 Boiling, however, can drain veggies of B-vitamins, vitamin C and other nutrients, Di Noia and Wright said. Cooks who choose to boil spinach or collard greens should save the nutrient-rich water, either including a little with each serving or re-using the water in sauces or soups, Di Noia said. Wright agreed. "We encourage you to use the liquid. If you have a bowl of green beans, have some of the liquid with your serving of beans," she said.